The Socialist Republic of Vietnam is set to host a US aircraft carrier from the pacific fleet. 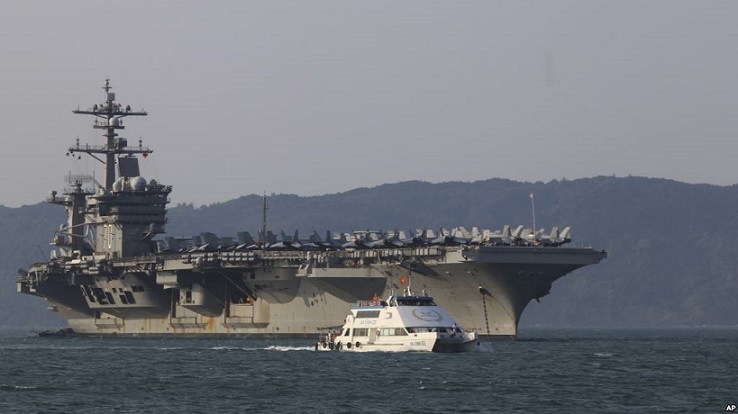 The USS Carl Vinson will be docked in Vietnam, and this will send a clear message of hostility from Vietnam to the People’s Republic of China. The South China Sea has been a point of contention in recent years, as China works to secure the route of oil tankers and other importing vessels destined for Shanghai and other Chinese ports. The USA seeks to maintain its ability to stop China’s oil supply at any time with a heavy military presence in the pacific. China has escalated its military presence in the South China Sea, looking to make sure that no matter what happens in international relations, the huge apparatus of production on the Chinese mainland cannot be shut down by a US blockade. A Chinese corporation is currently working to construct a canal through Nicaragua, so that imports to China crossing into the Pacific can never be compromised. While Donald Trump cancelled the Trans Pacific Partnership, and promised a divergence away from the Obama-era strategies, he has continued courting Vietnam as an ally against China. In the early months of his administration, the Trump White House promoted dissidents and religious activists who sought to overthrow the Communist Party of Vietnam. Trump seemed to be reassuring the anti-Communist Vietnamese exile community that he would not continue Obama’s overtures toward Hanoi. However, Trump has not reinstated the arms embargo against Vietnam which was lifted in 2016, and the docking of the USS Carl Vinson will be the largest US military presence in the Southeast Asian country since the “Fall of Saigon” in 1975. But as China’s Cultural Revolution escalated, and the Gang of Four of ascended following the fall of Lin Biao, China’s tensions with the Soviet Union took on a different character. China began to speak of the Soviet Union as “Social-Imperialists” and “the main danger” to the world. The “Theory of Three Worlds” laid the ideological basis for Mao Zedong to welcome Richard Nixon to Beijing, and establish diplomatic relations with Washington. Henry Kissinger, advisor to Richard Nixon, is widely credited with the strategy of recruiting China as an ally against the Soviet Union in the Cold War. The withdrawal of the USA from Vietnam after Nixon’s “secret plan” of mass bombing failed, was viewed as a humiliating defeat for the United States. The Pentagon strategy of “peace through strength” fell out of favor in Washington, and those who advocated covert action and the funding of proxies had the upper hand in foreign policy strategy. President Jimmy Carter called himself a student of CIA strategist Zbiegnew Brzezinski. The Carter administration talked a language of detente and non-interventionism to the world, while the USA escalated its covert operations in Latin America and Central and Southeast Asia under the surface. While Kissinger’s strategy for normalization of relations between the USA and China on the basis of opposing the Soviet Union laid the basis for the divisions, the Kampuchea War, in which thousands of Vietnamese, Cambodian, and Chinese people lost their lives, came about by utilizing the strategies of Brzezinski. This was the same strategy that Brzezinski had implemented in Eastern Europe. In Czechoslovakia, Hungary, and many other parts of the Eastern Bloc, Brzezinski had mastered the art of manipulating youth and intellectuals. Most of the young people who received covert support from US intelligence as they destabilized Marxist-Leninist governments did not advocate capitalism, but articulated some brand of middle class leftism. The Prague Spring of 1968, the Hungarian Revolt of the 1956, and many other anti-communist uprisings fomented by the CIA involved young people who believed they were “anarchists,” “Trotskyists,” “syndicalists” or “democratic socialists.” These young people, often from intellectual strata, with grievances against their government were effectively manipulated to serve the west. The ultra-leftist rhetoric served as a cover, as Washington manipulated them as pawns against the Soviet Union and its allied Marxist-Leninist states. Pol Pot was a wealthy Cambodian intellectual who had studied in France. He considered Soviet society to be overly rigid and authoritarian, and wanted to implement a more utopian and anti-industrial leftist vision in his home country. Whether he was aware of it or not, much like the idealists in European color revolutions, the US Central Intelligence Agency aided him in implementing his ultra-leftist, anti-communist potpourri. The Khmer Rouge served as a counter gang of sorts, preaching Communist sounding rhetoric as they rallied people in Cambodia to fight against Vietnam and the Soviet Union. While the US backed government in south Vietnam collapsed in 1975, Vietnam was unable to begin the process of peaceful socialist construction until 1980. War with China and Pol Pot’s “Democratic Kampuchea,” covertly supported by the United States, kept the country in a state of war for another half decade. Since peace was established in 1980, the Vietnamese Communist Party has made huge achievements in raising the life expectancy and increasing the standard of living for the population. The official position of the Vietnamese Communist Party is that they have not fully achieved the construction of modern socialism like China, Cuba, and other countries, but that they are diligently working toward that end, utilizing foreign investment in the process. While Washington’s strategy in the late 1970s was to support China and Pol Pot against Vietnam, which was a soviet aligned country at the time, in the present time, when China has ascended to the role of a global superpower, the strategy has flipped. Now US leaders court Hanoi, hoping to maneuver it toward becoming a satellite against Beijing. The hope is that Vietnam can become a mechanism in the operation of preventing China from securing the South China Sea, and maintaining the potential US “oil veto” over Chinese industry. While there is a long history of war and hatred between the people of China and Vietnam that goes back centuries, the people of Vietnam and the people of China are now both led by Marxist-Leninist Parties. Both countries have overturned capitalism, are constructing state controlled planned economies, utilizing market mechanisms. While Vietnam continues to respond in-kind to Washington’s overtures, there are clear disagreements about this within the Communist Party. The fall of Nguyen Tan Dung, the most anti-Chinese voice within the party, seems to indicate that anti-Chinese sentiment is not universal. The Vietnamese Communist Party seems to be clashing internally when it comes to many issues, including economic policy, as well as foreign relations. While Vietnam’s path forward is unclear, Washington’s strategy is very clear. The hope is that Vietnam and China, despite being led by ideologically similar parties, and having the same goal of eliminating poverty and raising the standard of living with socialist planned economies, can be turned against each other. “Divide and Conquer,” the catch phrase of conquerers in ancient Rome, remains applicable in 2018, as Wall Street and London seek to keep their grip on the world.